The state legislature established the Indiana Seminary. The first professor, Baynard Rush Hall, was not comfortable teaching mathematics, so the first courses taught were only Latin and Greek. John Hopkins Harney, the first professor of mathematics, joined the university. President David Starr Jordan introduced specialty degrees, the precursor to majors as we know them today. At this time, a real Department of Mathematics formed. Marcellus Neal, the first African-American to get a degree at Indiana University, received his A.B. in Mathematics. The first Ph.D. in Mathematics at Indiana University was awarded to Cora B. Hennel. Among other things, she founded the Euclidean Circle, the precursor to today’s IU Math Club. The department lounge in Rawles Hall (where the Math Club currently meets) is named after her. Hennel stayed on to rise to the position of full professor. She was a poet, administrator, and gifted public speaker. Elbert Cox, an undergraduate Mathematics and Physics major at Indiana University, was the first African-American to receive a Ph.D. in Mathematics in the United States. There are pictures of him in the Physics Club and the Euclidean Circle, the Math Club founded by Cora B. Hennel. A short biography of Elbert Cox appears at the Mathematical Association of America website, and a longer article is available to those with JSTOR access. Agnes Ermina Wells is hired as Dean of Women and leads the initiative for women’s dormitories and a supportive residential life. She was an instructor of mathematics, continued her education, earning a Ph.D. in astronomy from the University of Michigan in 1924. She retired as Dean of Women in 1938 to become a full-time Professor of Mathematics and Astronomy. She retired from IU in 1944. Goodbody and Memorial Hall, half of the Wells Quadrangle, were rededicated as student housing in August 2017 in her honor. David A. Rothrock, professor of mathematics since 1895, became Dean of the College of Arts and Sciences, serving in that capacity until 1937. Students loved Professor Rothrock and honored him with cartoons in the Arbutus. Awards for both graduate student teaching and faculty teaching have been endowed in his name. Emil Artin, who had fled Nazi Germany, joined the Department of Mathematics and remained until 1946 when he was appointed Professor of Mathematics at Princeton University. Artin was a major figure in mathematics in algebraic number theory. Max A. Zorn joined the department. Famous for Zorn’s Lemma, he was also revered by those who knew him well for his resistance to Nazi policies in Germany in the early 1930s. He remained in Bloomington for the rest of his life, participating in departmental life long after his retirement in 1971. The department’s postdoctoral program is named after Max Zorn. Work of IU Mathematics Professor Václav Hlavatý solving equations related to Einstein’s unified field theory was featured in the news media as one of the great scientific accomplishments of the year. The Department of Mathematics has been running summer research experiences for undergraduates in some form in most years since 1966 when the National Science Foundation sponsored Undergraduate Research Participation Programs. Our current Research Experiences for Undergraduates program has been nearly continuously funded by the National Science Foundation since the early 1990’s. The Journal of Rational Mechanics and Analysis founded by Václav Hlavatý and Clifford Truesdell changed its name a second time from the Journal of Mathematics and Mechanics to the Indiana University Mathematics Journal. The Department of Computer Science forms out of a program in computer science within the Department of Mathematics. On April 4, 1995, the Department of Mathematics moved from its long-time home, Swain Hall East, to its current home, Rawles Hall. Departmental Chair John Ewing presided over the dedication of Rawles Hall, giving a detailed history of the department’s first 100 years. The Finite Show aired live at 9 p.m. every Monday and Thursday evening. The production was funded through a Lilly Foundation Retention Grant, which also supported the creation of the two-course Finite sequence D116-117 and the formation of the Math Learning Center. The Department of Statistics forms out of a program in statistics within the Department of Mathematics. The Department of Mathematics establishes a Directed Reading Program under the guidance of Zorn Postdoctoral Fellows Corrin Clarkson and Jeffrey Meier, who experienced and enjoyed the programs earlier in their mathematical careers. Directed Reading Programs pair undergraduate students with graduate student mentors to study mathematical topics outside the standard curriculum. 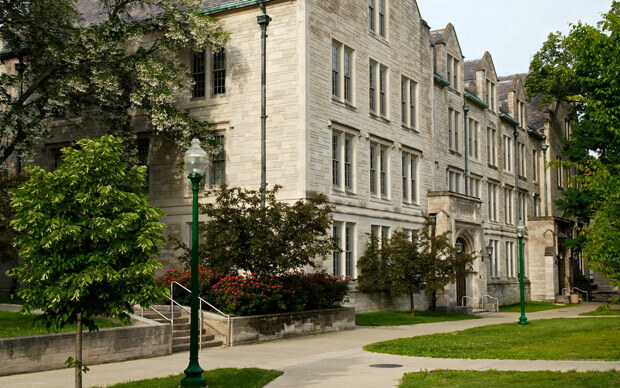 The Department of Mathematics resides in Rawles Hall, a building built with Indiana limestone, and in this regard very characteristic of Indiana University's Bloomington Campus. Originally it was the home for the Department of Social Science. Since being renovated in 1995, it has housed the Department of Mathematics.